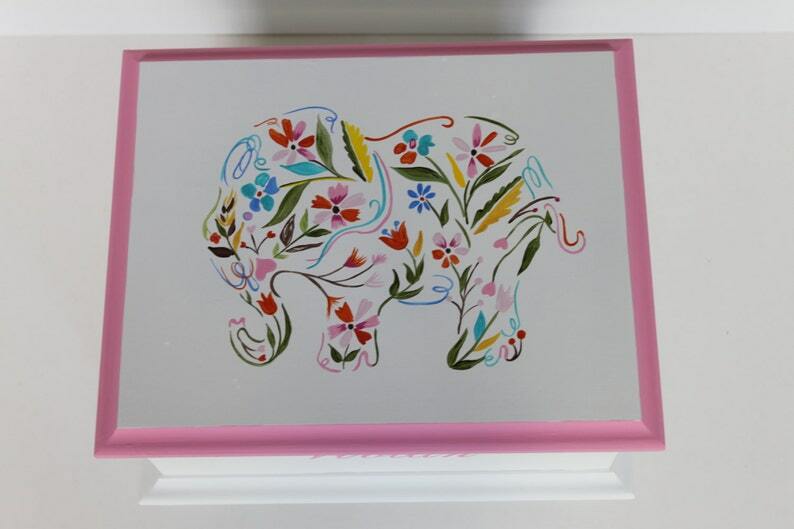 Made in the USA, this hand painted, poplar wood keepsake box is adorned with a floral elephant silhouette and may be personalized with your child's name or 3 -letter monogram. The keepsake box includes a first tooth and lock of hair envelope on the inside lid and has a fabric liner in the bottom. Box measures 10" x 8" x 5.5" on outside and interior measures 8" x 6" x 3.25". Custom colors are available. Adorable and extremely well made! I was looking for a gift for my daughter's 1st birthday - something she could keep forever and cherish as a special gift from her parents. This keepsake box is so beautiful and exactly what I was looking for! The quality of craftsmanship is stunning - from the beautiful hand-painted elephant on the lid to the personal custom details they added for me (I wanted to add an inscription under the lid). They were fast and timely, and I'm absolutely thrilled with how the final product turned out!